Each year the nation’s top high school theater programs are nominated by regional and national theater organizations to participate in the prestigious Edinburgh Fringe Festival in Scotland. Applications are reviewed by a board of college theater professionals from across the country. This year, the JCHS Drama Department was selected as one of the top 57 drama programs from among thousands of applicants in the US and Canada! There will be seventeen students in the JCHS Scotland Company that will include two tech crew participants. At “The Fringe,” students will pursue audience members “grassroots style” by handing out flyers and talking up their shows to passersby on Edinburgh’s Royal Mile. “There are thousands of companies and individuals doing this at the same time,” explains Performing Arts Chair Dylan Russell, “all trying to get an audience for their show. 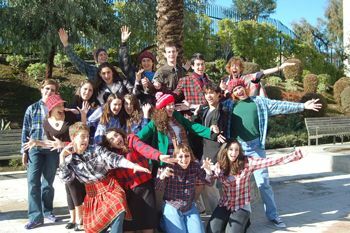 The students will have to use their chutzpah to persuade people to come see it.” While much of the avant garde Festival’s performances take place in transformed theater spaces such as alleyways, conference rooms, and nursery schools, the JCHS cast is slated to perform on one of the official stages. As with other acts, they will have 90 minutes to perform and just 15 minutes to put up and take down their props, many of which the group will be packing in their luggage. To take advantage of this rare opportunity, JCHS must raise more than $125,000 from our community to fund the company’s travel, lodging and participation in the Festival. Each participating student will raise $1,000 toward the cost of his or her participation fee, and the Company will raise $5,000 collectively as a group towards the cost of the trip. “Since the student company is being asked to fundraise for their trip, they will learn about how companies raise money for a show and some of what producing entails,” explains Dylan. This year’s fall musical, The Sound of Music, boasted JCHS’s largest student involvement to date including 24 performers, 5 musicians, 16 technical crew members, and 23 scenic artists. All four performances sold out in an unprecedented three weeks! Ticket sales from the show raised $11,000 toward helping to send our talented students to Scotland. The JCHS Drama Department has become known over the last decade for its professional-quality performances. Over the course of a student’s four years at JCHS, he or she will experience a wide range of styles, periods, and types of theatrical productions including international and American classics, documentary theater, comedy and improvisation, musicals and new plays – both professional and student-written. In the same manner as professional playwrights, students do readings and multiple re-writes, rehearse daily, and work with actors and the director to refine the script. They also do PR interviews and audience talk-backs after performances. In 2007, JCHS opened a 200-seat state-of-the-art Performing Arts Theater which facilitates student involvement at all levels including: set and costume construction; lighting and sound design; technical theater training; collaboration with studio art classes for scenic painting and prop fabrication; and partnerships with guest theater professionals from the SF Bay Area community. *Visit www.jchsofthebay.org/scotland to purchase tickets to upcoming JCHS productions, donate to the Scotland Journey and view our list of supporters.